I can't slept last night because I really don't want to be on call today and luckily I didn't. Hee. I just wish, for God sake, just cancel the sample. Since I can't sleep, I took the chance and have a blogwalking session to the bloggers who left their comments on previous post. Thank you for the support, fellas! I was shocked when I read above comment and my jaw almost dropped with the review when I read it. OMG! The review was so.. how I can put in words? I just like, Allahu.. Allahu.. Allahu.. Kak Shikin, I am so touched with your sincere review about me. This is first time someone studied about me, try to know me better. I started active in blogging since in my study period and there are a lot of bloggers who I still remember, we kept commented on each other's blog and I really like how it bonded us together. But, time flies and some of them stopped blogging because of their life's commitments and so on, including me. Just recently, I try to get on the track. And Kak Shikin is one of them and until now I still remember her blog, Starlavenderluna. You nailed it in my mind. Haha. First of all, thank you for saying me a friendly person. Actually, I am not good in stranger because most of the time I tend to be paranoid. But I feel comfortable be in blogger's circle and maybe that's why they said I am a friendly person. Secondly, like I said, you make my jaw dropped because you read my bio and even search for my full name 😂. I thought nobody cares! Hahaha. But there is a correction. I do not work in engineering company. Actually I am an industrial engineer in a factory. I just called my study course as course kilang (factory). Hehe. Thirdly, I touched when you said I inspired you. Are you kidding me Kak Shikin? I way too far to be the one. Even myself have many things to learn about blogging stuffs. I am not a good writer though. This is why I love about blogging. Even we're never meet face to face, through writing, this is how ukhuwah bonded us together. Kak Shikin, thank you so much for your du'a at the end of the post. It was beautiful. I wish you are always happy in what you doing, be with and who you are. Just show your sincerity and people will acknowledge you. Xoxo, Zizie Zack. awwwww... you guys are so sweet. Samalah kita Zizie. Baru baru ni baru nak pick up balik blogging ni. Walhal lama gak berhenti sebelum ni. 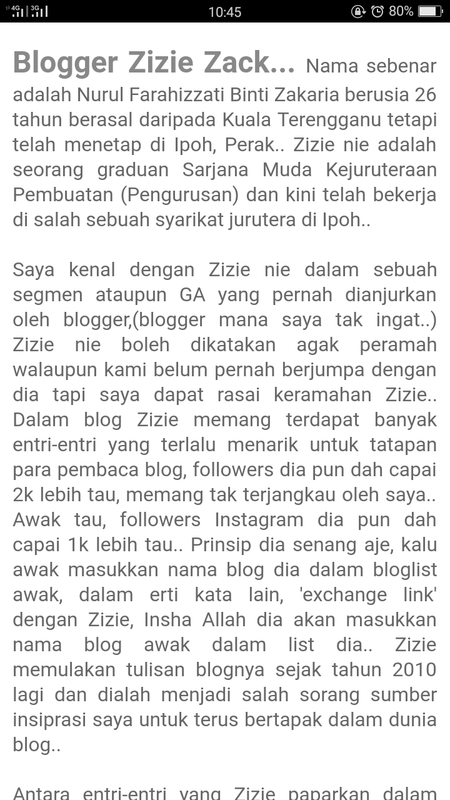 akak terjah dari blog shikin la ni. 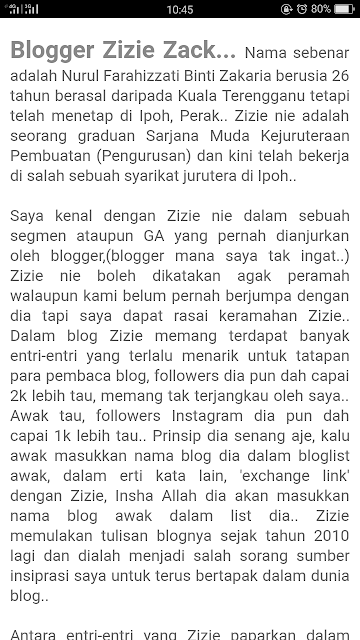 done follow u.
lama sudah shikin blogging. lebih kurang aida. but this is the first time aida terjah sini. same here, ramai kawan2 blogger yg da stop blogging. yg slowing down pun ramai dah. now, semua mostly kawan2 baru. untung la ada orang review blog dia. bukan senang tu nak dapat. 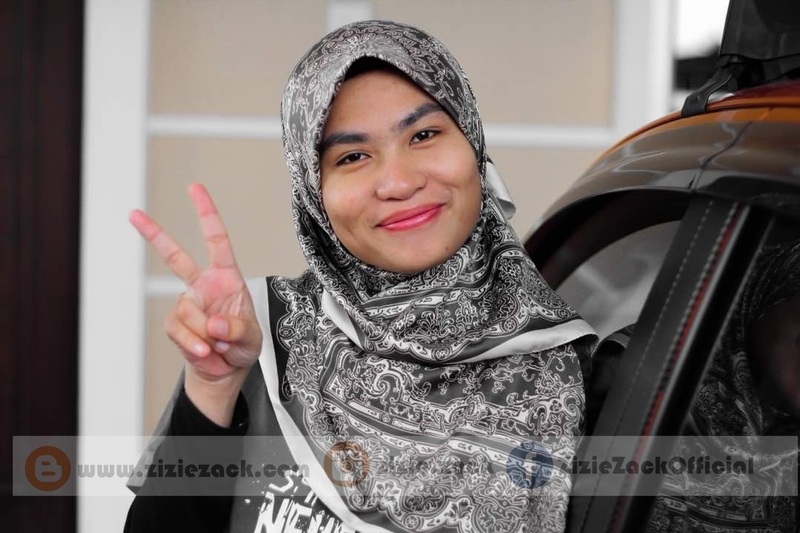 Selamat Hari Raya Aidilfitri Zizie..
Itulah kemanisan ukhuwah antara kita rakan bloggers..
Tak pernah bersua muka tapi terasa ada keserasian..
Semoga ukhuwah ini berkekalan selamanya..
Selamat hari raya Kak zizie. Ya semoga ukhuwah antara blogger berkekalan. hihi. Hihi, alamak... Dah salah bagi info sebenarnya, wink-wink, sori..sori.. Anyway, terima kasih atas entri nie dan di hujung-hujung Syawal nie akak nak ucap Selamat Hari Raya Aidilfitri, maaf zahir dan batin.. Apapun terus sukses tau..